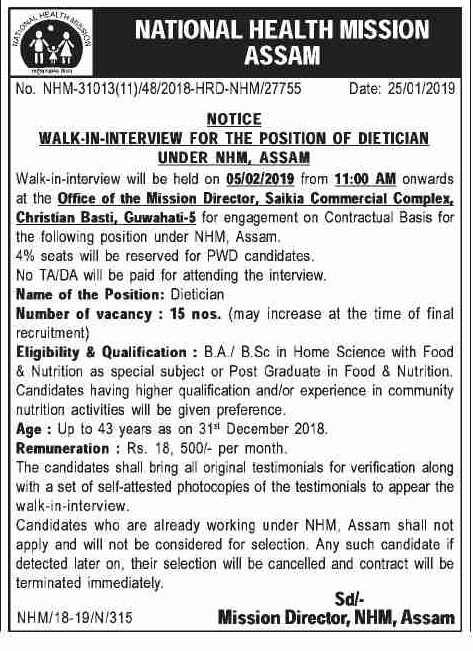 Walk-in-interview will be held on 05/02/2019 from 11:00 AM onwards at the Office of the Mission Director, NHM, Saikia Commercial Complex, Christian Bassi, Guirrahati-5 for engagement on Contractual Basis for the following position under NHM, Assam. Educational Qualification: BA/ B.Sc in Home Science with Food & Nutrition as special subject or Post Graduate in Food & Nutrition. Candidates having higher qualification and/or experience in community nutrition activities will be given preference. Age: Up to 43 years as on 31st December 2018. Remuneration: Rs. 18, 500/- per month. How to apply: The candidates shall bring ail original testimonials for verification along with a set of self-attested photocopies of the testimonials to appear the walk-in-interview. Candidates who are already working under NHM, Assam shall not apply and will not be considered for selection. Any such candidate if detected later on, their selection will be cancelled and contract will be terminated immediately. Venue: Office of the Mission Director, NHM, Saikia Commercial Complex, Christian Bassi, Guirrahati-5.